Business premises on the corner of Park Street and the High Street, vacant as of October 2018. 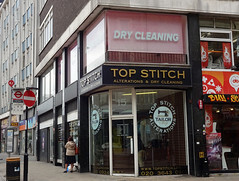 It was previously occupied by an alterations and dry cleaning shop called Top Stitch, but in September 2018 this moved down the road to 69 High Street due to redevelopment of the entire block photo of notice. Previously a hairdressers called Hair By Alan D (as of July 2008 and also as of July 2009, according to Google Street View). The premises remained vacant until March or early April 2017, when an alterations and dry cleaning shop called Top Stitch opened photo. In September 2018, this moved down the road to 69 High Street due to redevelopment of the entire block photo of notice. Last edited 2018-10-17 15:43:46 (version 42; diff). List all versions. Page last edited 2018-10-17 15:43:46 (version 42).